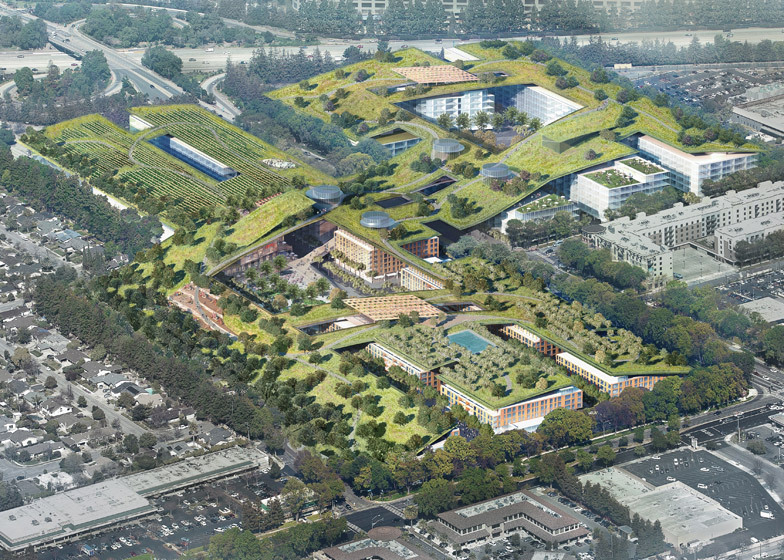 Aiming to turn Cupertino into the green center of Silicon Valley, this expansive green roof design rolls over 30 acres of central urban real estate, capping a massive mixed-use redevelopment project. The resulting street-crossing expanse is set to include miles of walking trails, vineyards, orchards, playgrounds and an amphitheater. Developers from Sand Hill Property Company assembled the constituent real estate, including a partially abandoned Vallco Shopping Malls, from separate owners. 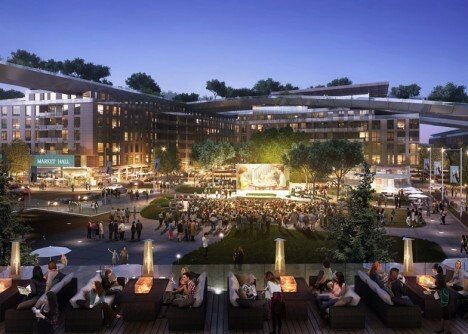 Their proposal to create nearly 1,000 apartments and over a million square feet of office space was developed in part by architect Rafael Viñoly with the assistance of OLIN Landscape Architects. In the buildings below, a cinema, gym, shopping center and ice rink are slated for construction, revitalizing the downtown area and integrating with outdoor elements above. “The Hills at Vallco features an unprecedented 30-acre community park and nature preserve, which will not only be the largest community park in Cupertino, but also the largest green roof in the world” according to the developers behind the scheme. The plan has been pitched to the city as a way to secure its position as a hub for technology and innovation in California. The project is currently entering a public review phase. Critics note that feasibility may be an issue, citing the architect’s record with a London skyscraper known for blowing over pedestrians and lighting cars on fire.